The expansion department of Moventia is pleased to announce that, following the group’s strategic lines of action for growth, diversification and consolidation in the field of mobility, Moventia has become a shareholder of Autocares IZARO - a benchmark company in the discretionary passenger transport service sector. We have the pleasure of presenting to you a company with over 48 years of experience, positioning it as one of the best options for mobility services and vehicle and coach rental services catering for all sorts of leisure activities, tourism, incentives, conferences, conventions, school trips and major events to the highest standards of quality. IZARO employs a team of over 180 professionals seeking a common goal: to meet the needs of all the customers using their discretionary and regular services. 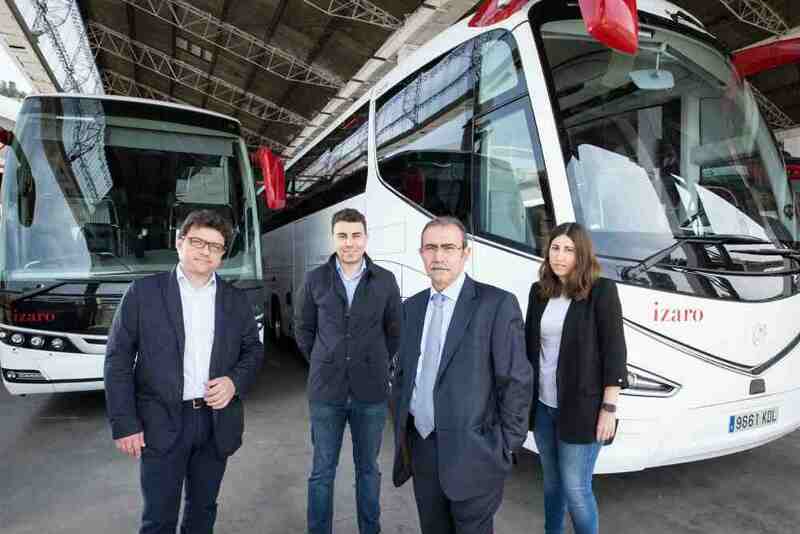 IZARO has a large fleet of coaches and premium discretionary transport vehicles. A total of 130 vehicles with an average age of 6.2 years includes several highly exclusive vehicles with luxury interiors for its premium Izaro Status services. These are all equipped with the latest market innovations, both in terms of comfort and safety (ISO 9001:2008 for quality, ISO 14001:2004 for environmental issues, OSHAS 18001:2007 for occupational health and safety; ISO 39001:2013 for road safety management and UNE 13816:2003 for regular transport), and are fully adapted for persons with reduced mobility. Welcoming IZARO into the Moventis group—with its history, tradition and strength in the sector—will strategically consolidate the period of growth undertaken by the group in recent years and bring complementarity and synergies at both a regional level throughout its sphere of influence and at an operational level with the other companies in the group, which also operate regular and discretionary services and are fully aligned with the Moventis mentality to offer the best response to any mobility need expressed by people, companies and institutions. The current management team at IZARO will continue to be led by Manuel and Diego Tena (from the second generation of the family) and by Manuel’s children Mari-Cel and Kevin Tena (third generation), who are the Commercial Director and Fleet and Garage Manager, respectively. They will all maintain their current roles at the company headquarters in Zona Franca (Calle Virgen María del Puerto in Barcelona), at their magnificent and fully-equipped 18,000 m2 installations that include both offices and parking areas. The companies Poch, Calella Moventis, Emilio Seco, Carrilets Turístics, Izaro, Pujol and the discretionary services departments of Sarfa and Casas now make up a new vehicle and coach rental services business area that will be run by Miquel Martí Pierre, who will combine these responsibilities with his role in the group’s expansion area. The entire IZARO team can now count on the full support of everyone at Moventis and Moventia and, by warmly welcoming them into the fold, we hope that this will be the start and future basis of a new period of ongoing success for us all.